How to calculate return on assets? What is a good return on assets? 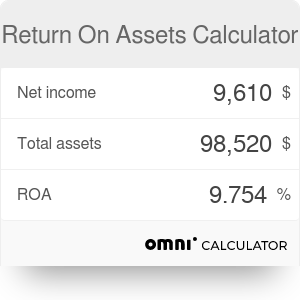 Return on assets calculator is a tool which has been created to help you calculate ROA - one of the popular ratios in business. Want to know more about it? You are at a good place! What is return of assets and, what's more, what is a good return of assets? And, obviously, how to calculate return on assets? These are crucial questions connected with this topic. We hope that this short article will provide you with all the knowledge about ROA you need. Perhaps the first question you come across is very obvious and sounds: "what is return on assets?" ROA (return on assets) is company's net profit in relation to its assets value. This way, we can rate the profitability of assets. This indicator informs us how profitable the company is in generating profit from its assets. It is very important, for example, when a company wants to take a loan. In such a case, the bank will surely want to look into ROA data because it shows how effectively the company will spend the borrowed money. Internally, ROA is used to evaluate whether it is necessary to change the company's strategy in the area of sales and managing assets. As you already know that ROA is the relation between net profit and total assets value, derivation of the formula is very simple. You need the two variables which we have discussed above: net profit and total assets. The next step is to divide the first one by the second. Once you've done this, the only thing you have to remember about it is to multiply the result by 100%, as ROA is always expressed as a percentage. Now let's consider two examples with two totally different ROA ratios. As you can see, we have two absolutely different situations and you probably wonder which one is better for the company. Or... maybe you have some ideas already? Go to the next paragraph to find out whether you're right. You already know what is return of assets and how to calculate it, so it's high time you asked: what is a good return on assets? Here's the answer! ROA, similarly to, for example, ROE, should be as high as possible. The rule is simple: the higher the ROA, the better the financial condition of your company. It is excellent when it reaches several dozen percent, but it is very hard to get to this level and to retain such a value for an extended time period. Therefore, we can talk about a good return on assets when it is about 10-15%. It is also very important to look back into the history of company's ROA, as even a very good value does not have to mean long-term profitability of the company. Return On Assets Calculator can be embedded on your website to enrich the content you wrote and make it easier for your visitors to understand your message. It is free, awesome and will keep people coming back! Copyright by Omni Calculator sp. z o.o.